License Text distributed under a Creative Commons Attribution license, video distributed under a Creative Commons Attribution-NonCommercial-ShareAlike license. So you wanna get down and dirty and research a slumlord? I believe that each and every one of us has a right to a safe and secure, I’d go so far as to say cozy, place to call home. While I have not yet succeeded in making this a universal belief (and I do stress the yet), I will say there is widespread agreement that a landlord must maintain his building if you’re paying him rent. Given that most owners see our beloved homes as nothing more than income streams that are only hurt by maintenance expenses, this is always a cause of no small tension. There are, of course, those among the wider pool of investors who are out and out blankety-blanks. Buy me a drink sometime and I will tell you what I really think, especially as this post has nothing to do with the whys of slumlords, so don’t forget the larger forces at work here that also require attention! Far too many of our people are forced to live with rats, roaches, peeling paint, mold, an absence of heat, raw sewage, leaking pipes… the list goes on, as does my fury. If you’re going to dig deep and put the hours in to finding out exactly who is profiting off of such daily assaults upon their tenants, then I would first recommend love and fury in equal measures. They will make up for your learning curve, and sustain you in your attention to numbing detail and bureaucracy. Know them up and down, backwards and forwards before you do anything, and I mean anything. Slumlords don’t like tenants or tenant organizers getting uppity, so be extremely prepared. Dig out those contracts, read them, find out exactly what you’ve signed up for if you didn’t already know. I’m afraid to say there are often some nasty surprises in there. Those lawyers know what they’re doing. Cities and states have different laws protecting tenants, find out which ones apply to you. All of them have basic requirements for building maintenance. At best you also have your rent control (which limits how much an owner can increase your rent), and you have your just cause eviction (which limits the reasons you can be evicted). If your town has neither, then it’s just down to you and whatever you can negotiate into your contract. Make sure you have back up, and check out Vida Urbana/City Life to see just how much tenants working together have been able to negotiate into collective contracts. Knowledge alone isn’t power, I’m afraid. If it were my life would be much different. What knowledge does is allow you to use your power most effectively to place pressure where pressure will make a difference. You need to consider your options on how best to use it. You can pressure the owner directly. For example when I worked at SAJE, we once took a tenant delegation to meet with their landlord’s pastor. That stopped the harassment and threatened evictions pretty quickly. Another obvious target is the city or county, who are more likely to try and act effectively after you have built a picture of the landlord’s evil business operations and their effects on their tenants and community. The picture below shows the kind of strategic information that maybe be useful and where the pressure points might lie, but don’t let this limit you! Every landlord and city is different. There are undoubtedly other possibilities. Tenants: Collectively tenants tend to know quite a lot about the owners, particularly the ones who have lived there for a while. Talk to the neighbors, and pool your paperwork for company names and logos, manager or owner names, and mailing addresses. Google: I don’t know that it needs saying, but you should be googling any individual or business name, and the address. It’s quick, it’s free, you can do it in your jim jams; it’s always the best place to start. Allies: Who is working on tenant issues in your town? Chances are that they’ve run into the landlord if he owns a lot of properties, and they can tell you a lot — both facts about him and his other buildings, and his likely reactions to your organizing. Good things to know. Databases: These are often expensive and hard to access, it all depends on where you are. One of the best resources is Lexis Nexis. Any university student should be able to access this for you on their library’s computers, and you might well be able to get in there as well. Dataquick is another that contains California’s property records. Again, the CDs can usually be accessed by university students. And then there’s Merlin, your local Legal Aid might be able to access this. Merlin basically it gets you pretty much anything at all you want to know about an individual, it’s scary really. And therefore it is restricted to certain users and non-profits. Sometimes you know exactly who it is, but often you have no idea. It’s technically public information, and in a lot of places you can get the officially listed owner easily online. Of course in some places, like California, the state has essentially sold rights to this information to a private company (yeah, don’t get me started on that), but the information is still accessible if you go in person to the Tax Assessor’s office or the County Registry. Still, your new generation of slumlord will have protected himself from liability (though we’ve proved it doesn’t always work, no fear) by registering the property in the name of a limited liability company (LLC), a trust, or some other legal shield. Some of the sketchier landlords have been known to register properties in the names of their dog, a dead aunt, or an imaginary tenant, those are trickier and require street work. Think Sam Spade and go to it, but some of the below will still apply. If you’ve got a company name, all U.S. businesses have to file paperwork with the SEC. You can access that via their online search function at FreeEdgar.com. For a publicly traded company there’s lots of information as investors seem to like that. Sadly, landlords stay private and favor minimum disclosure, but the names of principals and mailing addresses is plenty to start with. Lexis Nexis is, however, the best resource really. So get your (virtual) file folders, your colored pens and stickers, bring every organizational capacity you have to bear from the beginning and it will all go easier, because the information becomes very overwhelming very fast! This is where you really want Lexis Nexis, unless the owner is kind enough to have lists of properties lying about online. The Public Records database will contain corporate and business filings and property deed information. You should search by company name, but often the real gold will come via a search using the mailing address…most large landlords set up multiple LLCs, but they all report to the same handful of addresses. Again, hit Lexis Nexis — their News, Company, and Public Records databases should cover everything. In one of our campaigns we found out that the landlord owned the hardware store which provided receipts as “proof” of repairs, as well as the management company. And a couple of restaurants. More than useful knowledge. You can establish who these are using the business information above. They might also be involved in the nefarious business of making money off of poverty, or they might not be happy about associating with someone who is. You can see the potential. This is one of the most useful resources. You can either find this via Lexis Nexis, or alternatively by a trip to the local civil and criminal courthouses. Lexis nexis is by far the best, as it doesn’t limit you to local jurisdictions. Being able to show that there have been other legal actions against the owner definitely establishes a clear pattern of wrongdoing. It’s also worth pulling the files from the courthouse, especially if the owner was ever deposed. Essentially that means the attorney asked him questions while he was under oath, and if you’re lucky she asked good questions about how the business was run, additional properties, and other things you’ve been dying to hear from the horse’s mouth. The lawyers and plaintiffs in previous lawsuits can also be an amazing source of information, and are definitely worth trying to get into contact with. Oh, and divorces…that whole divying up of assets thing. These also help establish a pattern and practice of wrongdoing, as well as proving the landlord’s burden on the average taxpayer. Most cities and counties have building and safety, housing, and health departments that either regularly inspect apartment buildings or respond to complaints. If the system is working in any sense (I’m showing my idealism here, I know), major slumlords should have lengthy records in many if not all of their buildings. It’s always good to know who has liens against the property, these can be found through lexis nexis or with the deed records. Lenders are often unhappy about a property they have invested in being allowed to fall apart, and there’s a possible argument that they have some liability. They have a lot of power given the owner owes them money, and they can step in as receivers of a building on the order of a judge, essentially taking over management. If the landlord is involved in local politics it could be bad news, large campaign contributions generally mean political support. But on the other hand, if you do your job well and wield press effectively, it could be fun watching politicians scramble to put as much distance between themselves and a known slumlord as possible. For Federal contributions you can search Federal Electoral Commission Info. For the State see Follow the Money, though it’s not complete. A google search should turn up political connections if not hard dollar amounts, once you’ve got the names behind the companies. Community ties may also expose some pressure points. Is the slumlord active on charity or community boards? Where do they go to church, synagogue, mosque? Whose opinion do they care about and who might be able to talk them into doing the right thing? I would say google and networking are equally likely to turn something up here. Finally, some of those business partners might actually be family members, which may be a way to hide assets. Double-check key relationships that keep coming up in your research. Here’s a last word on what to do with all of this information. (You know what they say a picture is worth.) Below you will find a chart of one family of owners I researched, along with their business partners (in purple), property holding companies (in blue), properties (in yellow and orange), additional businesses (in green), lawsuits and city actions (red squares). It started as a collection of circles and lines on butcher paper that I added to over months. Turning the data into a graphic had a lot of impact. 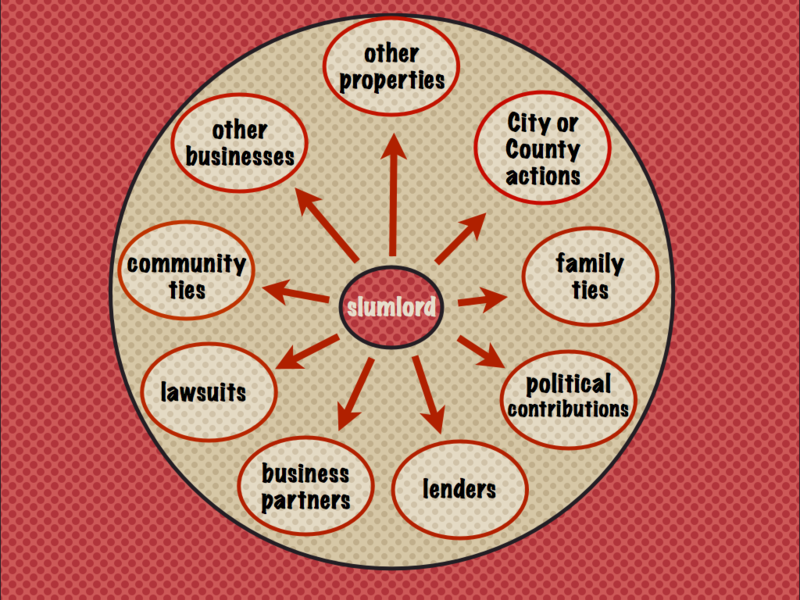 In this case we worked with the City Attorney’s office to actually take the owners to trial, and at the end of the day, the slumlords, as individuals as well as their corporations, were found guilty on 21 criminal counts (learn more about the Morrison Hotel Slum Housing Campaign). It is always nice to win. The Data Center was extremely helpful back then, and they continue to support the forces of good in all of their research efforts. Check out their website which contains a wealth of information on conducting campaign research of all kinds. I didn’t know it when I started, but the work we did to map out and analyze the relationships that emerged as a “slum empire” is called social network analysis. Valdis Krebs, a social network analysis expert, was of immense help in the resource process, and his org.net website is a great resource. There is even a case study of our example on his site that will give you good sense of the work involved in doing this kind of analysis. There is also ever more and more better social network analysis software to easily look at the kind of networks I painstakingly mapped by hand above, in a way that can be easily updated, including Inflow, which Valdis authored and we later used.